In addition to the DTOutlook plan, the I-4 Ultimate construction project is also bringing changes to downtown Orlando. Specifically connected to parking, downtown is going to lose the parking options under the I-4 bridge during construction – and after. 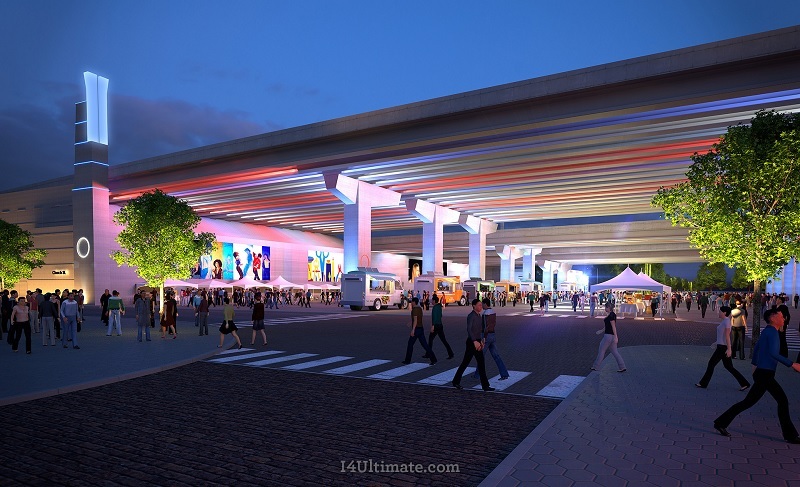 There are currently no plans to return or replace the parking spaces, and the new vision is to create a “bridge district” connected to the new proposed Amway Center entertainment complex and Church Street corridor. 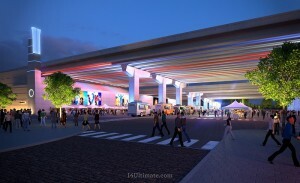 Rendering from City of Orlando’s DTOutlook vision plan of the I-4 bridge without parking options post-transformation. According to Florida Department of Transportation officials, only 25% of available parking will remain open under the I-4 bridge during construction according to the contract. It is still unknown when the parking will close as work begins, but the I-4 Ultimate project will also redesign portions of Hughey Ave. and Garland Ave. FDOT officials were quiet about any parking spaces being open after construction is complete. The new vision even suggests “artificial turf could be used to construct sports fields under I-4, either on a temporary or permanent basis.” So, no parking spots, but more demand for downtown parking. This all fits in with the Dyer administration’s policy and vision. The conversation got heated when business leaders jumped in to attack city policy in regards to construction of parking garages. Mr. Chatmon was asked directly by Project DTO members the reasons behind the city not allowing business or developers to build stand-alone parking garages. “I can speculate but I’d rather not,” Mr. Chatmon responded. City officials expressed there are no plan to change parking policies. City policy is clear on principal use parking, or stand-alone parking not associated with a project, in downtown Orlando. The business and developer complaints could be another reason why so much of the downtown construction includes levels of parking built into the projects. For instance, the proposed Tremont Realty development at Church Street Station just changed its plans and now wants a 10-story parking garage, along with a hotel on only 8 stories and office space on 7 stories. The old plan was for a 13-story hotel and fewer parking spaces. 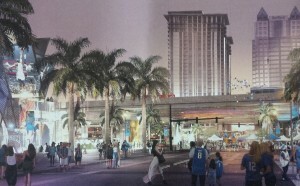 City of Orlando DTOutlook plan rendering. 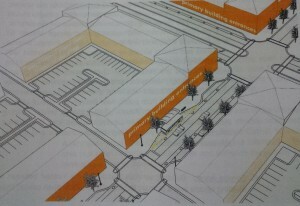 Where there are no parking garages, the City aims to locate surface parking options in the rears of buildings moving forward, according to the DTOutlook plan. To help combat all of the parking changes, the City of Orlando did recently announce the ParkMe app to help visitors to downtown find a parking spot. 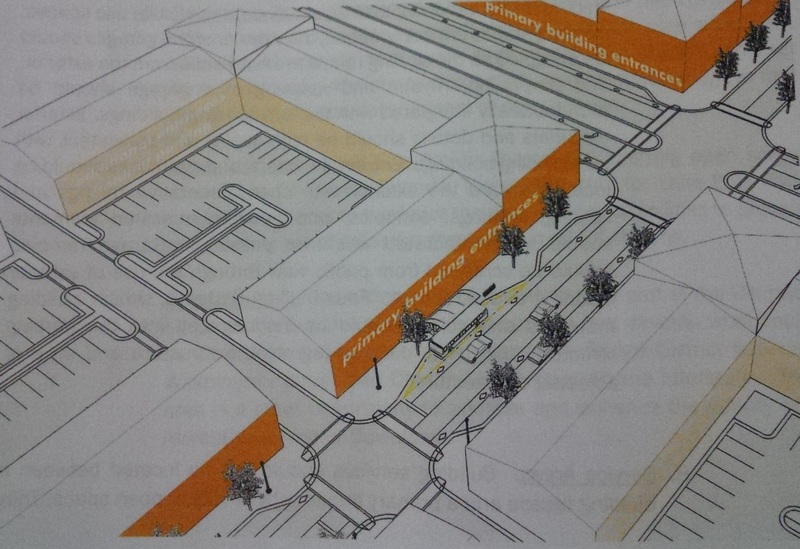 But the focus moving forward will be on a city-controlled centralized parking garage system, with limited on-street parking for high-turnover spaces. 2 Responses to "New Vision & I-4 Construction Impact Downtown Orlando Parking"
Well that is one way to look at the matter. Another way would be to question why a city and its flacks (the Downtown Development Board, ) determine that the taxpayer needs to spend $425 million to spruce up downtown which is 1000 acres of of the tens of thousands that compromise Orlando. What benefit is the money spent going to be to greater Orlando? Yes it will make downtown look swell, as no doubt the development of the Bob Carr promised and the development of the old Amway promised and the development of the new Amway and the Dr. P . Art’s center promised, but what does that do for the quality of life for the rest of Orlando? Does a spruced up downtown lead to higher paid jobs that are desperately needed? Does it lead to more affordable housing? Does it lead to greater safety within all of Orlando, not just the downtown? The authorization for the Downtown Development came in 1971 with the CRA coming in the ’80. We have had 35 to 45 years of trying to spruce up downtown. 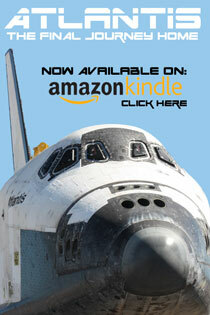 How has that improved the quality of life for all people in Orlando? Does a new cultural theater, that most cannot afford, or a new sports stadium for a billionaire really improve the economic stability for the whole community? We know in regards to the sports center spending that it is a deliberate lie that building a public stadium leads to greater public economic health. Hopefully a good economist with UCF or one of the other education institutions can shed some light on this continual cry for “redevelolpment” for such a small portion of this city. Exactly, Kelly! I’ve reviewed the full plans (not available online of course) and the $425+ million price tag in many places will only make current problems worse. The DTOutlook does outline many “challenges” or problems the city is facing throughout downtown’s various districts, but that’s the kicker, here we go again with another “vision” plan that just ignores the reality. You are right about that – I am planning to do a series spotlighting different elements of this new “vision” plan and parking was just the start. The sad thing about UCF is they are now totally connected to Dyer as the two push for the “Creative Village” UCF campus. It’s both funny and sad that the City essentially admits it has failed and wasted hundreds of millions of public tax dollars over the years, only to ask for hundreds of millions more. I also don’t understand how the same little group that surrounds Dyer is allowed to continue raiding public funds, but it is clear they have failed to spruce up downtown. Stay tuned for more, and I hope it sparks a real conversation in the community before this scheme repeats itself once again.